A twist on an old favorite. 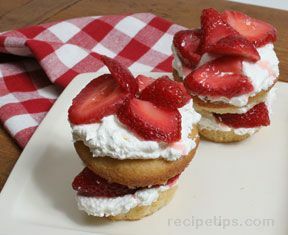 The sweet strawberries combined with cupcake always is a hit. Preheat oven to 350 degrees F. Line muffin tins with paper liners. In a medium bowl, combine flour, baking powder, baking soda and salt. In a large bowl, beat butter and sugar until light and creamy. Beat in eggs one at a time and vanilla. Turn mixer to low, and alternate beating in flour mixture and sour cream until combined. Continue to beat on medium until batter is thick and smooth. Fill liners 2/3 full. Bake 24 to 26 minutes, or until lightly golden and a pick inserted in the center of a cupcake comes out clean. Cool in pan 10 minutes then remove from pan and cool completely. For strawberry sauce, combine strawberries with sugar and let sit until this becomes syrupy, about an hour. Use a skewer to poke several holes into top of each cupcake. Spoon some syrup from bowl over top, allowing it to absorb into cupcakes. Top with strawberries and whipped topping. Drizzle with remaining strawberry syrup.